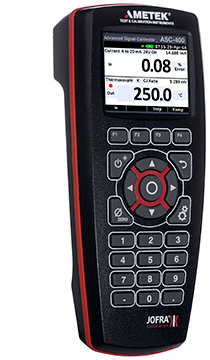 The ASC-400 multifunction calibrator provides popular functionality in an easy to use interface. How to set-up the portable ASC-400 multifunction calibrator. How to read pressure to 0.025% of reading accuracy with the ASC-400. Why scaling has never been easier than with the ASC-400 multifunction calibrator. How to calculate % error with the ASC-400 multifunction calibrator. How to set-up the auto-step function with the ASC-400 multifunction calibrator. BARO BARO Module – Converts gauge pressure measurement to the absolute scale. To read pressure with the ASC-400, you will also need an APM advanced pressure module. 104203 Test Leads with Black and Red Clips.